If your Communications needs are more complex or you have an existing system, perhaps a Managed Unified Communications (UC) Solution is the answer. A managed solution incorporates all of the features available with a Cisco UC solution, but the equipment is owned by you. Whether you have one location, or many, you will eliminate the hassle of managing multiple providers and incorporate a full suite of features throughout your network, all from your datacenter. If you are in the office or on the road, you will be connected to your network: Smart phones, Tablets and laptops all are integrated. 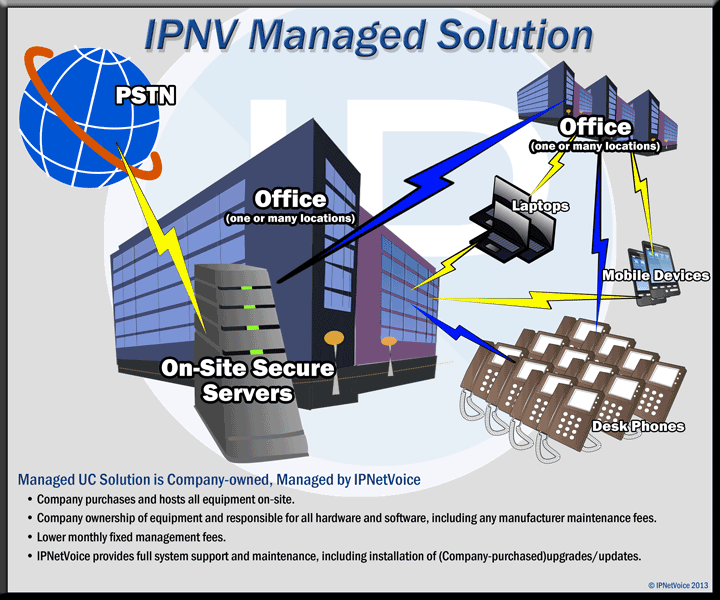 IPNetVoice Managed UC Solution provides you with all of the support needed. IPNetVoice provides full system support and maintenance, including installation of upgrades/updates. Up-front investment in hardware and setup. Low monthly fixed management fees per user or device. Customer retains ownership of the equipment.